BELIZE CITY, Mon. Mar. 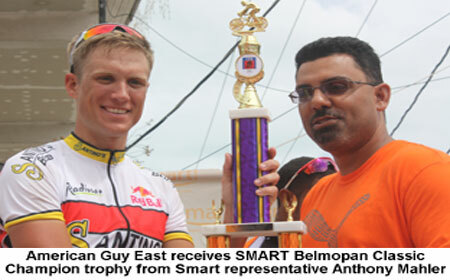 16, 2015–The 34th running of the Annual SMART Belmopan Cycling Classic ended yesterday, like last year, with a foreign rider taking top honors. Last year it was 20 year old Mexican Ignacio Bravo riding for the Benny’s Megabytes team; this year, the Santino’s Ride for Victory team returned to top level competition, and their foreign rider, American Guy East had too much going for his Belizean competitors in the last few miles of the race, as he broke away from a lead bunch of 7 riders, and rode in alone, followed a few seconds later in second place by 2012 Cross Country champion Geovanni Choto, now riding for the C-Ray Road Addikzx team. His teammate Brandon Cattouse was third. Fourth was Marlon Castillo of Santino’s Ride for Victory, and fifth was Jose Robles of Western Spirit. The Belmopan Classic took off from in front of the SMART headquarters around Mile 2 on the Philip Goldson (Northern) Highway, with the Elite race heading east to Belize City, over the Belcan Bridge and on through Cemetery Road on to the George Price (Western) Highway, travelling all the way to Belmopan, where they circled the Ring Road and retraced their route back to SMART, where they made one lap around the roundabout circuit before finishing the race in front of SMART. The Female and Junior races went as far as La Democracia before turning back to the same finish line. Top Female finisher was Kaya Cattouse of C-Ray Road Addikzx. We will have more details in our weekend issue. The last major cycling event in preparation for the legendary Holy Saturday Cross Country will be the Mount Hope Race, which comes up this Sunday, March 22.